Reducing the emphasis on financial accounting could be difficult given its institutional existence with established auditing firms as well as with universities whose accounting curricula are designed to prepare students to join those firms and pass CPA (Certified Public Accountant) exams. The challenge for company executive management and boards of directors is that immense importance, including salary and financial incentives, is placed on financial accounting results. Yet numerous international organizations and initiatives have identified flaws in current reporting that can derail strategies and cripple a business in the short and intermediate terms. Some of these are the International Integrated Reporting Council (IIRC); Professor Baruch Lev’s recent controversial book, The End of Accounting; the IMA® (Institute of Management Accountants) Statement on Management Accounting (SMA), The Conceptual Framework for Managerial Costing; the Financial Accounting Standards Board (FASB); and the International Accounting Standards Board (IASB). It’s critical that executive management and boards of directors recognize how limiting and less relevant external financial accounting and reporting are for supporting managerial decisions to create economic value for a company’s shareholders and owners. This is similar to the tale “The Emperor’s New Clothes.” Voices are needed to create awareness of this problem. So what’s missing? Top management should take the initiative and advocate adopting accounting valuation practices that more fairly represent the fundamental economics that underlie the operation of their business. The information should reflect the resources and processes they manage, and, most important, they should use it to make better decisions to be more competitive. Two core communities, investors and internal managers, are impacted by this increasing inability of financial reporting to reflect true economic value. Users of external reports, such as investors, are at greater risk if they can’t see what’s behind the numbers. Internal users, especially management and the board of directors, can also be misled to make poor or wrong decisions if they fail to have a clear picture of how intangibles create economic and financial value. Figure 2 shows how “hidden value” can be made visible. The left side of the Figure represents the publicly disclosed financial statements prepared according to Generally Accepted Accounting Principles (GAAP) or International Financial Reporting Standards (IFRS). First consider the published balance sheet at the top. 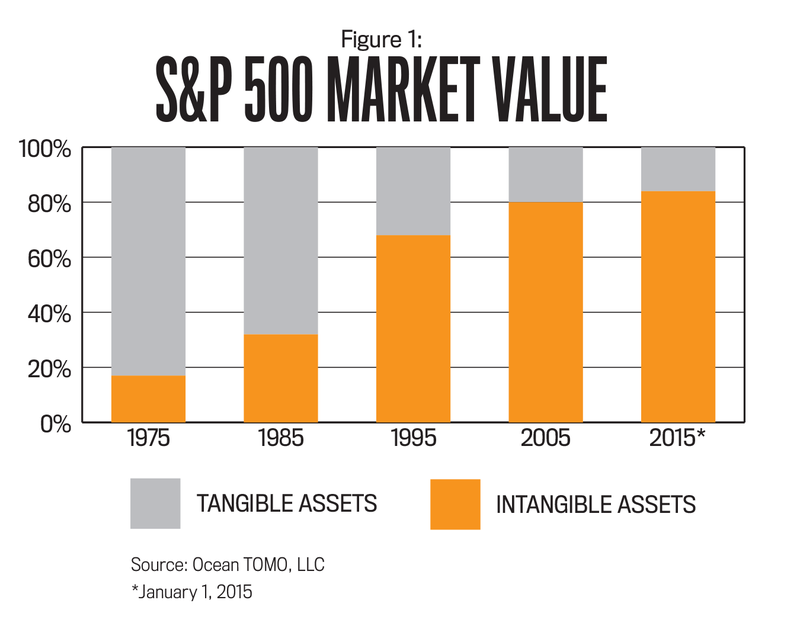 Early efforts to understand and quantify the difference between the book value and the adjusted value with added intangible assets can be traced back to the early 1990s and the rise of knowledge management and intellectual capital. More recent and ongoing work in the science of valuing intellectual capital has been undertaken and published by AREOPA, a thought-leading consulting firm specializing in this area (www.areopa.com, particularly the work of founder Ludo Pyis). There are several aspects to the intangibles that form part of the difference in value. The International <IR> Framework published by the IIRC identifies the six types of capital that constitute the resources an organization draws on to build its business model: traditional financial capital plus manufactured, human, social/relationship, intellectual, and natural capitals. The intent of the <IR> Framework was to combine traditional external financial reporting and supplemental reports in areas such as Corporate Social Responsibility (CSR) and Environmental, Social, and Governance (ESG) reporting, but it offers a broader opportunity to move toward integrated thinking. The objective is to quantify the various capitals that constitute the missing market value. The balance sheet assets plus intangibles collectively provide internal operational capacity and the capability to pursue a competitive advantage. A recent book focusing on business strategy (Beyond Competitive Advantage by Todd Zenger) makes a clear link between the creation of this unique internal capacity and the creation of economic value. In many cases these other capitals have a direct impact on the creation of the premium income in Figure 2 that has a direct outcome on financial earnings. Examples might include the impact on supplier (input) costs from a well-developed supply chain with positive supplier relationships, a positive internal environment that creates cooperation and collaboration that results in innovation and creativity, and customer relationships and a brand that lead to retaining and growing customer sales volume as well as lower sales costs per dollar of sales. For example, major manufacturers and their retailers who sell their products collaborate to identify and realize mutually beneficial cost savings in their supply chain management processes. Understanding these factors is important to investors when they are assessing current and future earnings streams and the risk of sustaining the value of their investments. Management’s resource allocation decisions can appear to create positive financial capital results through increased earnings, but they may have been created through cost reductions that depleted the human capital and thus set the stage for a less innovative and creative future. The inclusion of intangible assets acknowledges interdependencies and allows for trade-off analysis. Here are some examples where organizations suffered a strategic loss of competitiveness by improving profits through underassigning adequate resources. Early in the 21st Century, Jaguar and then-parent company Ford created the Jaguar X-Type sedan, which combined elements and hardware of the upscale and regular brands. Some drivers liked the car, but many Jaguar enthusiasts didn’t like the combination car because they thought it devalued the Jaguar brand. The Jaguar X-Type was discontinued in 2008 (www.edmunds.com/jaguar/x-type). The high-tech industry also isn’t immune from brand deterioration. The Hewlett-Packard (now known as HP) brand has suffered significant deterioration based on strategic and operational decisions. Outsourcing decisions at HP led to disintegration of the supply chain, intensifying competition. Together with a lack of innovation and vision, this instigated takeovers in an attempt to compete that led to bad acquisitions that drained HP’s resources (e.g., takeovers of near-bankrupt Palm in 2010 and software maker Autonomy in 2011). (courtesy of Brand Finance, January 2017). Focusing on traditional financial statements without understanding the underlying impact and interdependencies of intangibles and the capabilities they generate can drive poor decisions for investors, investment analysts, and internal managers. Thus management accountants have a clear and important role in developing integrated thinking that expands beyond financial capital into the underlying aspects and capitals that create an organization’s capability and value. The challenge is how to actually do this. Traditional accounting information is based on strict standards and rules defined by regulatory agencies, so it’s unrealistic to attempt to influence the regulators in the near term to modify their rules to include these nonfinancial “capitals.” Yet there are ways to start creating supplemental information that helps companies understand and report these intangibles and their impact. The ultimate goal should be to enhance the user’s ability to understand the value of these intangibles as well as their linkage to both economic and financial value and to operational impact. Let’s look at three of the additional types of capital: intellectual capital, human capital, and social/relationship capital. Where BV is book value, AC is acquisition cost, EC is enhancement cost, D is depreciation, IC is intellectual capital, and VI and VD are value increases or value decreases based on events. This approach recognizes the relationships and interdependencies between the categories of intangibles and quantifies the intangibles. 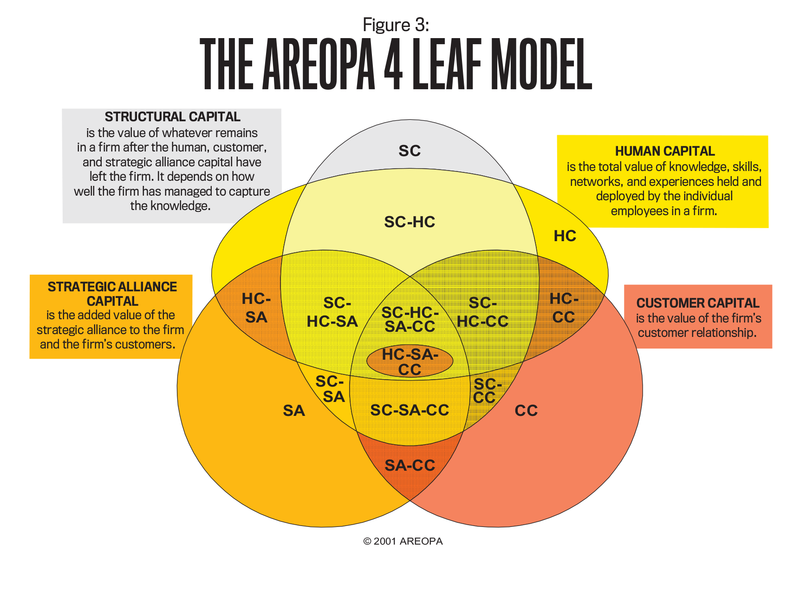 AEROPA has created a “4 Leaf Model” shown in Figure 3 to help management develop strategies to understand and manage four types of intellectual capital: social capital (SC), human capital (HC), customer capital (CC), and strategic alliance/network capital (SA). Using this individual organizational assessment, AREOPA develops up to 77 unique calculations that determine the future potential of the various intellectual capitals. With these calculations, an aggregate value can be determined as a base to be measured by a company’s accountants and reported as a supplementary accounting statement. The results of this calculation of future potential of intellectual capital plus the cost of creation provide a basis for valuation of overall intangibles. Intellectual property (IP) is a subset of intellectual capital and occasionally is recognized in financial statements. People form the foundation of economic value creation through their innovation, creativity, communication, collaboration, cooperation, agility, and many behavioral attributes such as ethical management, trust, and reputation. The most important question for management and for investors is whether everybody in the organization is being optimized. Expenses can be managed—and reduced to improve bottom-line results—but long-term economic and financial value and success can be attained only when all types of capital, including human capital, are contributing in ways that create and sustain both economic value and a continued competitive advantage (e.g., more innovative, faster, better quality, cheaper, smarter, safer). What tools are available to assess human capital? This type of capital is the foundation of organizational climate—the way things are done. Can it be measured? The U.K.-based Maturity Institute has developed a framework to assess organizational maturity based on 10 integrated principles that explain how people who are connected with organizational purpose link to value creation and risk management (http://bit.ly/2pWPs6i). Then these form the basis of assessing organizational maturity that’s depicted using the Institute’s OMINDEX or OMR. 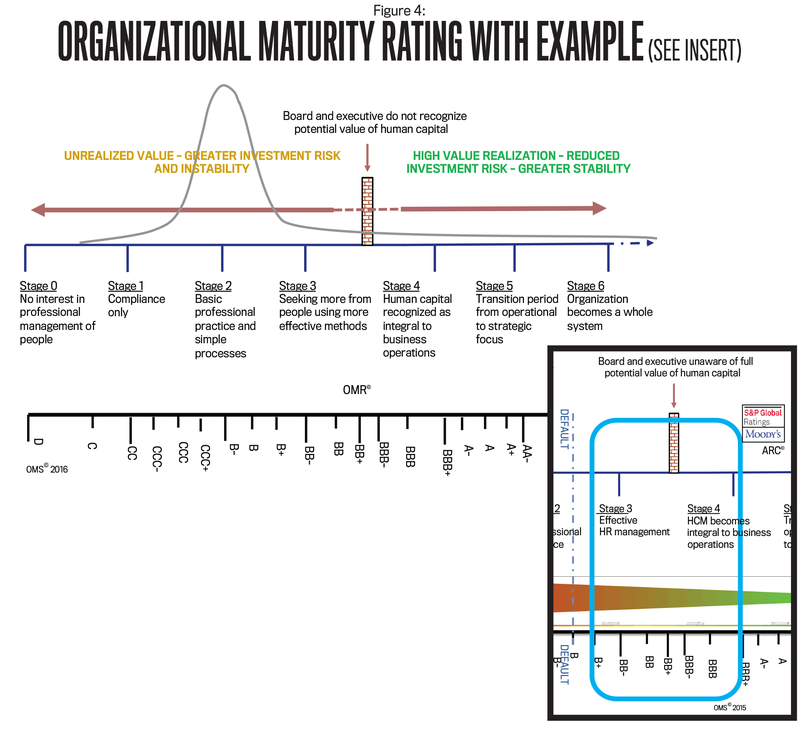 Figure 4 demonstrates the results of a Maturity Institute Organizational Maturity Rating (OMR) assessment. It shows where an organization ranks in terms of the maturity of human capital. The results are based on the 10-pillar framework that links human governance to long-term value and each organization’s approach to strategic, business, and organizational planning. Results are shown using a scale based on the S&P “AAA” credit-rating system. Results range from 0 to 6, with most organizations currently performing at a “B” level (between stages 2 and 3). This result shows that most organizations operate at a suboptimal level, which indicates a reduction of human capital potential. Using such an approach over time can provide managers and investors with an indicator of the current status as well as reflect an increase or decrease. (Is management action adding to or depleting human capital?) 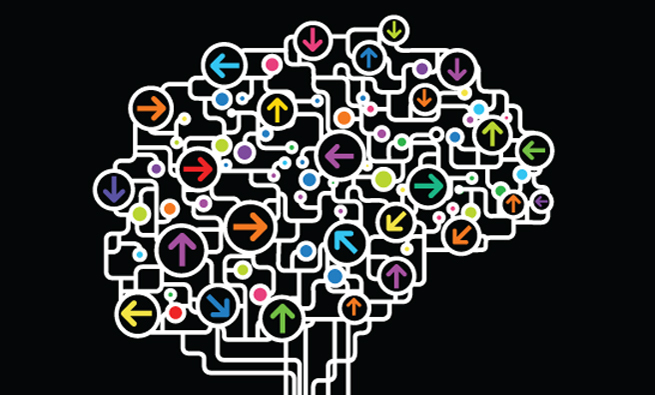 Superior organizations that concentrate on long-term thinking rate higher on this scale. For investor purposes, the OMR ranking can be compared to a traditional ranking on credit risk by indicating where there might be a risk gap. This gap occurs when organizations are currently ranked higher by credit authorities compared to the longer-term strategic OMR. The insert in Figure 4 shows the results of an Organizational Maturity Services (OMS) 2016 assessment using publicly available information that indicates the company might have a gap between what the traditional credit-rating agencies felt was its financial risk (BBB+) and the OMR results, which indicated (B+). In this case, the Maturity Institute felt that an underlying risk to future earnings existed. It appeared that several human capital factors necessary to achieve strategic goals stated by the company weren’t addressed anywhere in public reports or supplemental filings with the Securities & Exchange Commission (SEC). This implied that management was unaware of these issues in its key risk assessment or its Management’s Discussion and Analysis (MD&A). 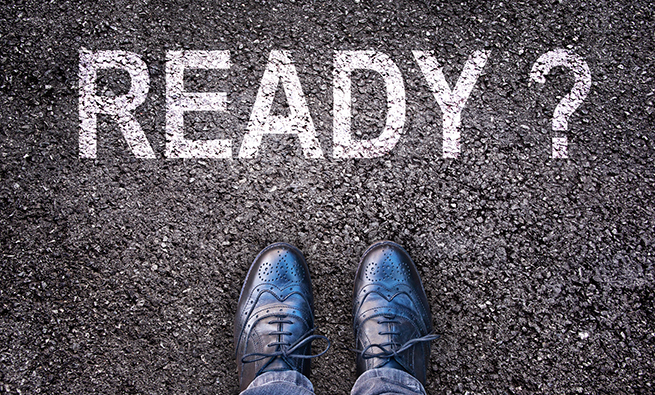 Many organizations use metrics such as hours of training, but those have little value in determining whether the outcomes reflect a higher-performing workforce or one that’s vulnerable to “depletion” as needed skills change. Increasing the ability of an organization to be constantly developing its human capital will make it more agile and responsive. More useful indicators of the value of human capital might be the percent of revenue from products that didn’t exist five years ago, savings generated through suggestions and improvements, and other metrics that attempt to link effective management of human capital to improved outcomes. Relationship capital typically would include the “outcome value” demonstrated by an organization’s brand and reputation. 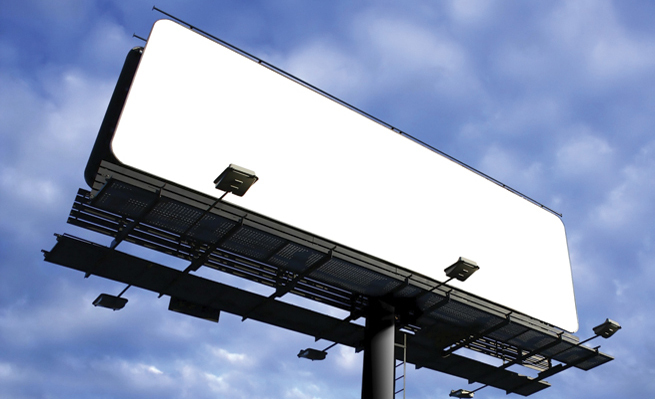 Brand value is of key importance to managers. From a strategic and operational planning perspective, whatever the market attributes to the brand in terms of believing it to have a value should be understood, sustained, and improved wherever possible. If management doesn’t have this knowledge, it can make decisions that may deplete brand value. 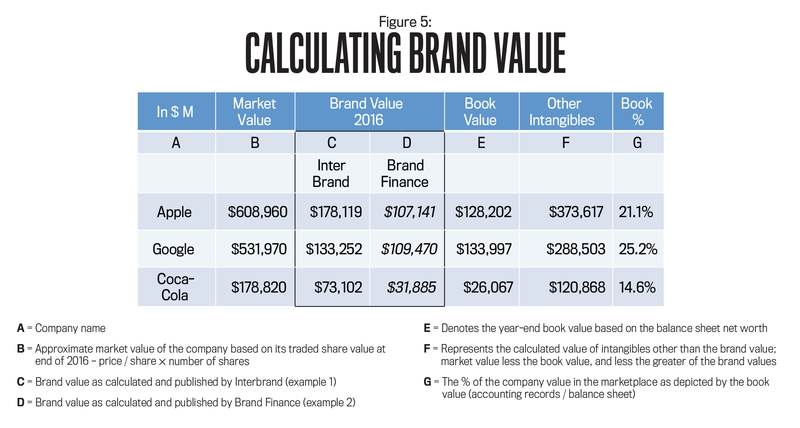 The ability to calculate brand values already exists, and Figure 5 demonstrates what a significant element of overall intangible value a brand might be. It also provides an example of the brand values of three top global organizations at the end of 2016. As the earlier reference to Ford revealed, Ford’s desire to optimize financial capital depleted relationship (brand) capital, which ultimately depleted the overall value of the business. For one example of how to determine and measure brand value, see ISO 10668:2010, “Brand valuation—Requirements for monetary brand valuation,” published by the International Organization for Standardization (ISO) at www.iso.org/standard/46032.html. 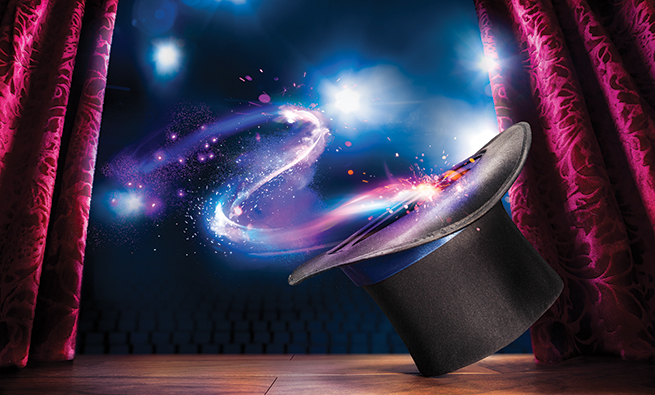 For many organizations that have been involved in mergers and acquisitions, the composite value of intangibles—including brand—is a core part of the price the acquiring company paid. This is a significant “asset” for which the shareholders have exchanged cash or depleted their share value to acquire and would expect to see it earn a return. Yet significant write-offs of goodwill balances still occur because management believes there has been an impairment of the intangible asset. The questions shareholders should be asking are “What intangible was being purchased effectively as an investment?” and “Why has it been depleted?” With anywhere between 50% and 85% of M&As failing to deliver the desired financial results, understanding and reporting this seems to be an important issue. Similar to the work being done regarding human capital, there’s significant development in the relationship and social sphere. The Enterprise Engagement Alliance (EEA) is an organization that has developed a framework for measuring engagement between key business partners (www.theeea.org and www.enterpriseengagement.org). Similar to human capital reporting, the use of engagement metrics can provide insight into the development or depletion of key relationships such as trading partners (supplier and customer) in a supply chain. Organizations that use the approaches of the EEA have been benchmarked against the S&P 500, and since October 2012 they have appreciated by 84.9% as compared to 63.5%, which would indicate enhanced performance. Other tools are evolving, such as the Social Value software from Seratio in the U.K. that has been developed to assess social impact of organizational investments. Being able to determine not just traditional return on investment (ROI) but returns in other “capitals” has become a critical issue in justifying both public and private expenditures. The approach developed by Seratio together with other initiatives can provide a measured assessment of the impact of assigning resources to investments where the payback may not be just enhancement to financial capital but to building social and relationship capital. 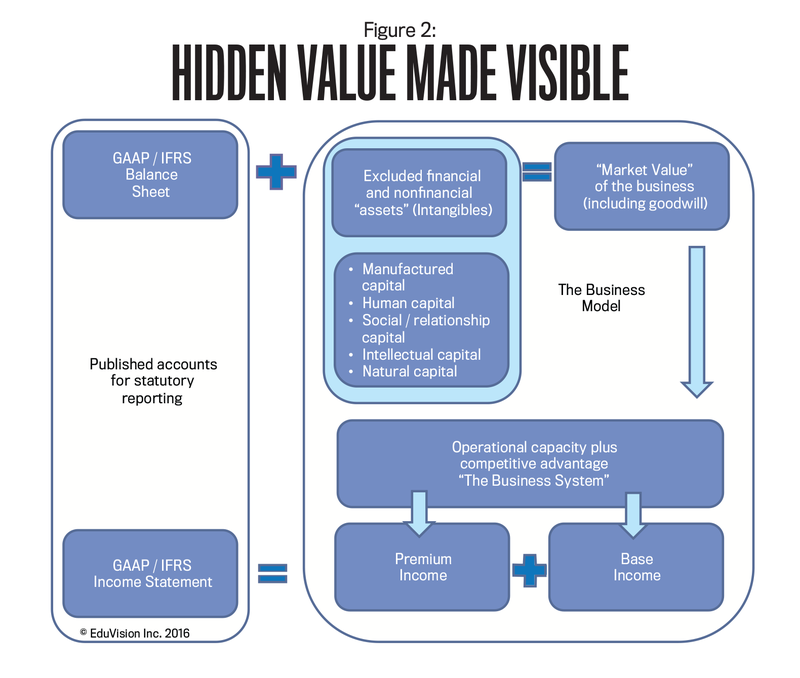 The value attributed to an organization in the free market increasingly exceeds the value as presented on a financial balance sheet—its book value. The reasons for this increasing valuation include capacities and capabilities that an organization has created—its intangible assets—which create financial value and returns to investors but that don’t appear in the financial records as assets. External financial reporting provides a limited insight to investors and other users about the value, condition, and sustainability of these nonfinancial factors. For investors, board members, or management, intangible assets must become part of what’s measured and managed. Their impact on economic and financial value must be sustained and developed, and any depletion occurring as a result of management decisions must be questioned and understood. External frameworks, such as the <IR> Framework, the GRI model from the Global Reporting Initiative, and the earlier SIGMA project model (partly sponsored by the U.K.-based ACCA (Association of Chartered Certified Accountants) and using five capitals), are being developed to expand reporting, include the intangible capitals, and increase transparency to enhance investor information. But much of this work remains at an early stage in its ability to link back to value creation. If these emerging frameworks are to impact understanding of organizational governance and accountability, then a bridge must be built between economic and financial value and the five nonfinancial capitals. 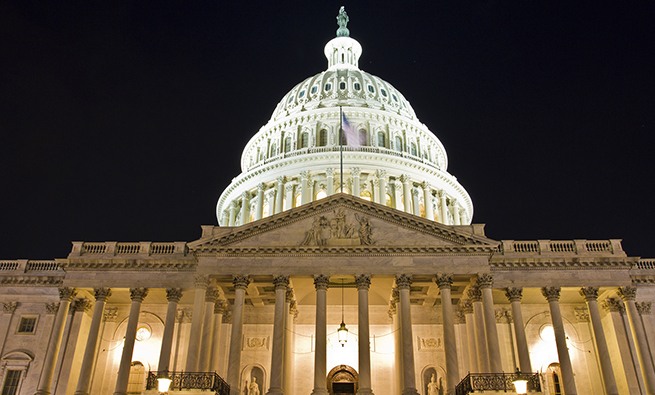 This will require research and published papers by professional accounting institutes, such as IMA, to lead the way to the accounting reforms described here. Further development of the <IR> Framework is also needed for it to evolve from a reporting model to one where intangibles become part of integrated thinking in driving strategic planning and resource allocation. If the accounting profession fails to embrace this emerging aspect of value creation and decision making, it might be relegated to a minor role in reporting that focuses only on the 20% of an organization’s value and neglects the 80%. Nick Shepherd, FCPA, FCGA, FCCA, is president of EduVision Inc. (www.eduvision.ca) and leads the work of the U.K.-based Maturity Institute on integrated reporting. Nick has more than 50 years of business experience in finance, general management, and consulting; is the author of books on corporate governance, controllership, and leadership; and has written several SMAs for IMA, such as the recent Behavioral Aspects of Cost Management. A member of IMA’s Toronto Chapter, Nick can be reached at nick@eduvision.ca.